코펜하겐, 덴마크의 단호스텔 코펜하겐 시티 | 호스텔월드에서 예약하세요. Groups bookings must always be prepaid in advance. We have a 6 weeks policy prior to arrival. If any changes after that we can refund the amount changed on the booking according to the terms and conditions of cancellation. 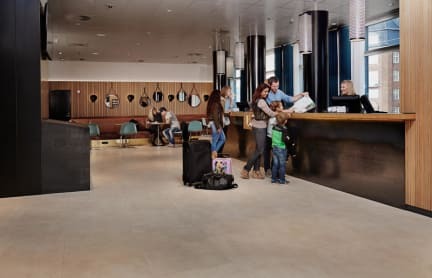 The five-star Danhostel Copenhagen City is located on H.C. Andersens Boulevard, a 10-minute walk from the Central Train Station and bus terminal. With 1,020 beds, we’re Europe’s biggest hostel. Apart from the building’s exceptionally fine view over the city’s skyline, the Opera House and Islands Brygge, we’re centrally located within walking distance of all major attractions, City Hall Square, Tivoli and the always-bustling city centre. We offer free Wi-Fi in all our rooms and on our ground floor you can find TVs for the guests to use. Grab a free book or leave one for others in our book exchange. If you're looking for more liquid entertainment, make yourself comfortable in one of Copenhagen’s cheapest bars, Bar50, located at the hostel! Our restaurant offers an all-you-can-eat breakfast buffet for an unbeatable price. We are looking forward to welcoming you to our hostel and our fantastic city! Please note that children under the age of 16 are not permitted to stay in the dormitory rooms. 호스텔이지만 시설이 너무 좋고 엘리베이터가 있어 캐리어를 옮기는 데 좋습니다. 또한, 수건과 침대 커버의 상태가 매우 좋아 편안한 휴식을 취할 수 있었습니다. 호스텔 들어가자마자 나오는 방탄소년단의 음악을 듣고 한국에 있는 것 같은 느낌을 받았는데 알고 보니 호스텔 관리자 중 한 분이 방탄소년단을 좋아하는 팬이었다는 사실을 알고 정말 반가웠습니다. 한국 문화와 K-pop을 사랑해주셔서 감사하고 덕분에 덴마크 호스텔에서 좋은 추억 만들고 왔습니다~! 가성비 좋고 시설 좋은 호스텔, 코펜하겐 관광시 가장 합리적인 호스텔. 최고였어요! 전망 좋은 곳으로 주셔서 여태 다닌 숙소 중에 야경이 가장 좋았어요! 엄청 큰 건물인데 카드키로 엘레베타 층수 안눌러도 알아서 척척 데려다주는 최신식 시스템. 첵인할때 수건 침대시트 주고 10명 있는 방에 묵었는데 한방에 4명 옆방에 6명 나눠져서 화장실은 한개지만 쾌적하고 좋았습니다. 위치와 시설은 좋았습니다. 스테프도 친절한 편입니다. 다만, 16층이라 수압이 너무 약해서 샤워하기에 불편했습니다. 전체적인 서비스에 만족합니다 다만, 여행시기적으로 사람들이 많아 그런지 청결매우 미흡했던 점이 아쉽습니다. 또한 직원들은 매우 찬절하고 지리적인 위치도 좋았습니다.